This property welcomes a maximum of two dogs. Visit England/AA - 5 * Gold self catering rating awarded October 2018. Positioned within the rural hamlet of Cardinham this detached stone built cottage is perfectly situated for those looking for a relaxing break. The Smithy retains some of its original features with stone walls present in various rooms throughout the property together with a wood burning stove set within a large inglenook fireplace. The cottage is within easy reach of ancient walks and graded cycle trails through Cardinham Woods. The beautiful beaches and fishing villages of the North and South coasts are within 30 minutes drive and there are many glorious gardens and historic houses including Lanhydrock House (approximately 5 miles) and the Eden Project within easy reach. Watersports and fishing are available at Siblyback Lake nearby. A real bonus for this location is the easy road access to both A roads providing an ideal base for exploring the whole of Cornwall. The nearby village of St Neot, approximately 4 miles, offers a local shop and a pub. The nearest main town of Bodmin, approximately a 10 minute drive, offers shopping facilities, pub/restaurants and a leisure centre. There are wonderful walks around the area including Bodmin Moor, approximately 7 miles away, and the Cornish coastal path. The nearest beaches Polzeath, Daymer Bay and Rockare all within a 30 minute drive. Daymer Bay & Rock allow dogs all year but there is a seasonal dog ban on Polzeath running between Easter Sunday and 30th September. There is a sloping concrete driveway providing parking for two cars with an uneven stone pathway leading to the front door. The front door opens into a hallway with a tiled floor with a feature stone wall and door leading to the ground floor W.C with a tiled floor, basin and heated towel rail. There is a step up and a door into the kitchen/dining room which is a light room with a feature stone wall to one side, dining table and seating for 6, ample storage, a seating area beneath the window overlooking the front garden, and there is a door into the utility room which has a basin with storage underneath. Completing the ground floor accommodation is a large sitting room with comfortable lounge seating arranged before an inglenook fireplace with a wood burner, oak flooring and lots of light provided by large windows overlooking the front garden. A carpeted staircase from the lounge with six steps lead up to the back door and a further seven steps to the first floor accommodation where there is a landing arranged as a reading area with two armchairs and a shelving unit with books, and three carpeted well presented bedrooms. A master bedroom with king size zip link bed with fully tiled en-suite shower room W.C with basin, a twin bedroom and single bedroom with day bed ,TV and Playstation 3. Completing the first floor accommodation is a family bathroom W.C with separate shower and bath. The front garden has a fence running along one side and a stone path leading to the front door, leads to the driveway and a path which runs along the side of the cottage into the rear garden. The rear garden benefits from established shrubs, has 9 steps up to the garden and decking area with furniture comfortably seating 6. 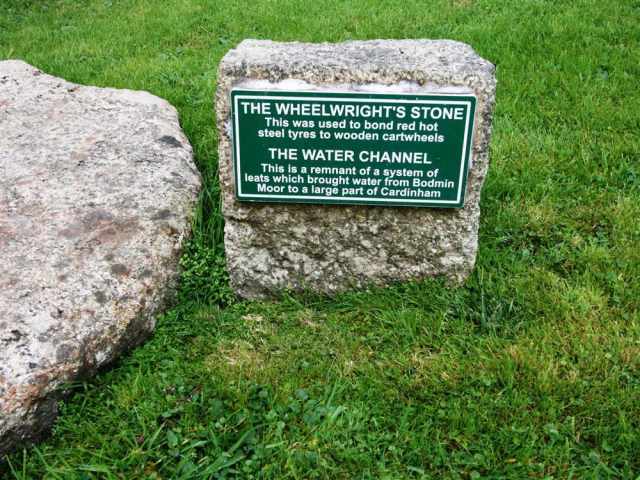 Two original features are prominent in the garden; Wheelwrights Stone which was previously used to bond red hot steel tyres to wooden cart wheels and the Water Chanel which is a remnant of a system of leats which brought water from Bodmin Moor to Cardinham.